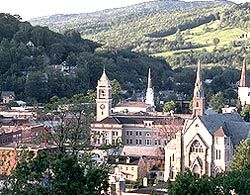 The Montpelier Historic District, in Montpelier, Vermont is roughly bounded by Memorial Dr., Bailey Ave., Hubbard Park, Vine St., and Hubbard St. Residences are private and not open to the public, but many of the businesses, institutions and government buildings welcome visitors. A walking tour is available. Further information can be obtained from the State of Vermont's Central Region Visitors Center, at 134 State St., open 8:00am to 8:00pm every day.